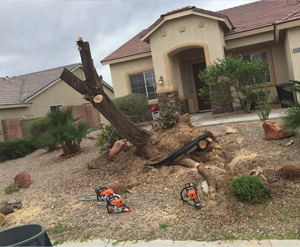 At Las Vegas Superior Tree Service, we have a proven track record of removing even the most hazardous of trees. Got palm trees? They’re no problem for us. While tree removal is very dangerous, it’s a cinch when you use specialized equipment. Accidents can happen – so don’t attempt tree removal on your own. Our employees, however, have an extensive record of excellence in safety. If you do need tree removal, make sure the company you choose has both workers compensation and general liability insurance. At Las Vegas Superior Tree Service, we have all the appropriate insurance and are happy to give you a copy. You also have the opportunity to contact the insurance company and verify it for yourself. Unfortunately, many companies operate without insurance, and if an accident happens, you can be held responsible. Before you have tree removal performed in the Las Vegas area, make sure you verify the company’s insurance. Whether you are in need of tree trimming, tree removal, stump grinding, storm clean up, land or lot clearing, Las Vegas Superior Tree service is your number one choice for affordable tree service in the Las Vegas Valley. Family owned and operated for over 10 years we are dedicated to providing our customers with the highest quality services.